JAMES S. McDAVID. Among the most successful and thorough-going business men of Coffeen, Ill., is James S. McDavid, who was born in what is now Bond County, November 11, 1842, and is the only son of William C. and Martha L. (Hunter) McDavid, both natives of the Slicker State, the father born in Montgomery County, March 1, 1820, and the mother in Bond County. Our subject's paternal grandfather, William McDavid, was a native of Virginia, who was born in Scott County, and remained there until about fifteen years of age, when he went with his brother, James McDavid, to Missouri. Later he enlisted in the War of 1812 and participated in the battle of New Orleans. In Juno, 1820, he came to Montgomery County, and located in East Fork Township, where he entered land from the Government, paying $2 per acre for it, in installments. He and his wife came on horseback and brought all their worldly goods with them. They erected a log cabin, 14x14 feet, and with very little furniture began their career as pioneer settlers. On this farm he resided just forty-six years to a day, dying on the 14th of February, 1866, when seventy-five years of age. His father, Patrick McDavid, was born in Scotland and came to America when a young man, locating in Virginia. His wife was born in Ireland. William McDavid married Elizabeth Johnson, a native of Tennessee where she was reared; she lived to be eighty-three years of age. Her father, Jesse Johnson, it is supposed was a native of Tennessee. The grandparents of our subject were married in Franklin County, Tenn., by Squire Haulen in 1819, and directly afterward came to Montgomery County, locating on section 34, township 8. They were the parents of nine children, five sons and four daughters, all natives of Montgomery County and East Fork Township, and all of whom grew to mature years with the exception of one, the youngest, who died when about seven years of age. Only four sons are now living in this county. William C. McDavid passed his youthful days in his native place, and, as he was obliged to walk four miles to attend school, his scholastic training did not amount to much, for he seldom attended more than three months in a year. After leaving the district school, he finished in a log schoolhouse in Hillsboro, and remained with his parents until twenty-one years of age. He was first married March 11, 1841, to Miss Martha L. Hunter, a native of Bond County, and one son was born of this marriage, James S., the subject of this sketch. Following his marriage, Mr. McDavid located on section 34, on a forty-acre farm, and as there had been no improvements made he went to work to clear and develop his place. He erected a small log house and gradually gathered around him many of the comforts and conveniences of life. He owned at one time four hundred acres but gave his son one hundred acres, his daughter eighty-five acres, and has retained two hundred acres for himself. When starting out for himself, he owned two horses, a cow and calf and forty acres of land. After the death of his first wife, he married Miss Lydia C. Wilson, September 2, 1856, and five children blessed this union, two daughters and three sons: Sylvester, deceased; L. J., of Hillsboro; Emily E., wife of D. C. Nisler, of East Fork Township; Dr. John Logan; and Nancy L., deceased. In his political affiliations, Mr. McDavid is a Democrat and has held a number of local positions. He was Constable for four years and Justice of the Peace forty years. For fifty years, he has been an Elder in the Cumberland Presbyterian Church and is one of the pioneers and much-respected and honored citizens of the county. He was a member of the Masonic fraternity. 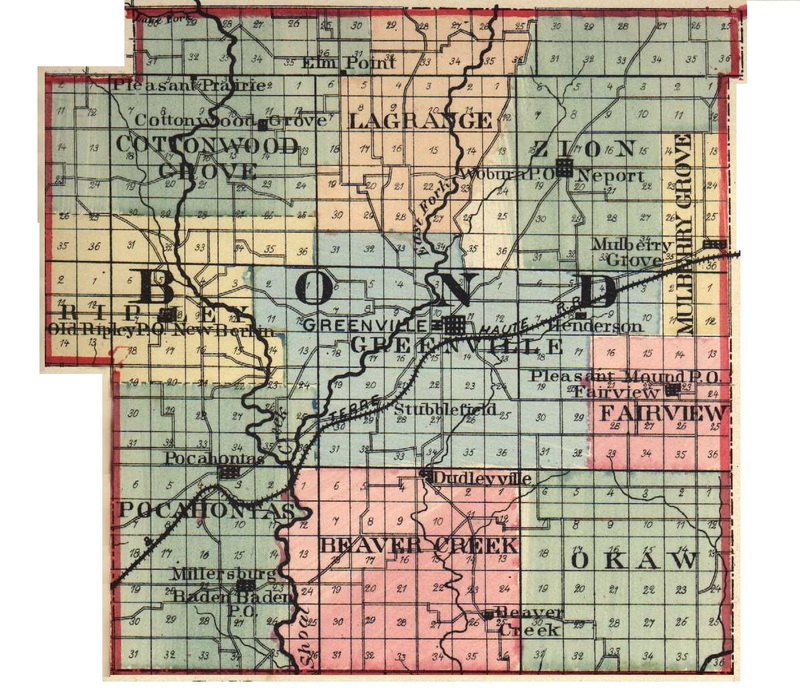 James S. McDavid was born in what is now Bond County on the 11th of November, 1842. He assisted his father on the farm until twenty-one years of age and received a fair education in the common schools. In 1864, he began working by the month on a farm for his uncle, James B. McDavid, and continued with him until 1865, when he enlisted in Company K, Third Illinois Cavalry, which was stationed at Eastport, Miss. About one month later, Gen. Lee's army surrendered and our subject's command was sent to- Minnesota and Dakota to fight the Indians. There he remained a little over seven months, and on the 30th of September, 1865, they were mustered out at Ft. Snelling, Minn., and discharged at Springfield, Ill., on the 19th of October, 1865. Returning to Montgomery County, our subject entered the school room as a teacher and followed this very successfully for about twenty-five years, in the meantime attending Hillsboro Academy. In 1864, he had attended the Mt. Zion Seminary for one term, the summer prior to his entering the army. In September, 1890, he embarked in the coal business and is now Secretary of the Coffeen & Copps Company, at Coffeen, and also the Treasurer of the company. This company employs on an average about seventy-five men and is doing a rushing business. On the 31st of August, 1870, Mr. McDavid married Miss S. A. Mitchell, a native of Missouri, born in Monroe County, and reared in Macon County, and to them have been born four children, two daughters and two sons. The eldest died in infancy; Martha C. died when seven years of age; L. S. and James M. Socially, Mr. McDavid is a member of the Farmers' Mutual Benefit Association, Modern Woodmen of America and Lodge No. 368, K. of P., of Coffeen. Our subject is a Democrat but was a Republican until Grover Cleveland was nominated. He has been Township Clerk for East Fork Township three terms, Supervisor three years, and Chairman of the Board the last year. He was Superintendent and President of the Village Board in 1891, and is now Trustee or Alderman of the city. He was School Treasurer in East Fork Township for ten years. Extracted 20 Dec 2016 by Norma Hass from 1892 Portrait and Biographical Record of Montgomery and Bond Counties, Illinois, pages 374-376.